All over the world and throughout history humans greeted each other when they met, and parted ceremoniously via some gesture (of the hand, most commonly). Some animals share the greeting ritual, in various modes of sensory communication, but do not say goodbye to each other before leaving. Why is that? If a friend of mine comes over to my place for a dinner party, and leaves without announcement of some kind (let’s assume he didn’t have an unexpected emergency that pulled him away), I would probably be in a position to become rightly offended. Was it the food? Didn’t he like the company? Wasn’t he comfortable? Why didn’t he say goodbye? Is he some kind of animal? Leaving without saying goodbye means that his experience at my house was negative. It could be negative to the point of dissolving our future relationship, in other words, he left unceremoniously because he doesn’t want a future with me anymore. So here is the crux: animals don’t live by any concept of future the way humans do. A dog meets another dog and greets it to establish the boundaries of this encounter in the now. When it’s time to leave it simply points its nose to some interesting direction and gets going. No offense taken. For us humans many other meanings factor into the equation. A human is the kind of creature that lives a story, and each story has its proper form. Each story also comes to a conclusion eventually. When my story concludes I will leave, but not before saying goodbye (I hope). A friendly goodbye with a smile is the last impression me and my friend leave each other within the depth of our subconscious. It is a promise for an equally happy get-together next time, sometime soon maybe, hopefully. My story and script are being written while being acted out, live and improvised. Whatever wake I leave behind me is my own, personal Road of Life. Whichever direction I pick to point my compass towards, it would be the horizon my heart yearns for now. Walking my path of life, never knowing whose path I might cross tomorrow. The purifying storm (1-Kawok) left debris of old habits and mindsets in its wake, so a new trail must now be blazed. This trail begins with 1-E’, and develops over a 13-day journey through ever-developing aspects and intentions. 1-E’is a southern trecena, since it begins with a southern sun-sign (E’), and it has more southern sun-signs (4) than any other direction (3 of every other). The southern sun-signs in this trecena appear on the days 1, 5, 9, and 13, and they are contrasted by 3 northern signs on the days 3, 7, and 11. When drawing a line connecting the yellow (southern) signs in the above figure, a trapezoid is formed, which gives the trecena a stable southern base. If the contrasting white (northern) signs are connected a triangle is formed, with 7-Tijax at the apex. Being a southern trecena, 1-E”s theme is abundance: plenty of Roads (1-E’), plenty of Wisdom (5-Aj’maj), plenty of Suns (9-Ajpu) and plenty of networks (13-Kat). The absent southern sun-sign is Q’anil. What could that mean? “Every day is a winding Road” sings Sheryl Crow (5-Kat), and this is the main message of 1-E’. Every day a winding road is taken, while countless other roads are inevitably forsaken. The sun-sign E’ is called “the Road of Life” and it stands for abundance through humility, stewardship and simplicity. Another famous saying which applies to this day is “there is a difference between knowing the path and walking the path”. This trecena accentuates the presumed conflict between trying to make everyone happy and dwelling on the compromises that result from such expectations. This is the day when I begin walking the path and knowing it. “Every day is a winding Road” sings Sheryl Crow (5-Kan), and this is the main message of 1-Eb. Every day a winding road is taken, while countless other roads are inevitably forsaken. The sun-sign Eb is called “the Road of Life” and it stands for abundance through humility, stewardship and simplicity. Another famous saying which applies to this day is “there is a difference between knowing the path and walking the path”. When I surrender completely to Billie Holiday (1-Eb)’s voice, without any distractions whatsoever – it can make me cry every single time. This is especially true when listening to the following song, which is about the difference between knowing what time it is and having a good time with someone you love. 1-Eb is a southern trecena, since it begins with a southern sun-sign (Eb), and it has more southern sun-signs (4) than any other direction (3 of every other). The southern sun-signs in this trecena appear on the days 1, 5, 9, and 13, and they are contrasted by 3 northern signs on the days 3, 7, and 11. Being a southern trecena, 1-Eb’s theme is abundance: plenty of Roads (1-Eb), plenty of Wisdom (5-Cib), plenty of Suns (9-Ahau) and plenty of Seeds (13-Kan). The absent southern sun-sign is the sign of the Star (Lamat). This means that the plenty on offer in this period is more grounded and realistic. The purifying storm (1-Cauac) left debris of old habits and mindsets in its wake, so a new trail must now be blazed. This trail begins with 1-Eb, and develops over a 13-day journey through ever-developing aspects and intentions. 1-Eb is a southern trecena, since it begins with a southern sun-sign (Eb), and it has more southern sun-signs (4) than any other direction (3 of every other). The southern sun-signs in this trecena appear on the days 1, 5, 9, and 13, and they are contrasted by 3 northern signs on the days 3, 7, and 11. When drawing a line connecting the yellow (southern) signs in the above figure, a trapezoid is formed, which gives the trecena a stable southern base. If the contrasting white (northern) signs are connected a triangle is formed, with 7-Edznab at the apex. The sun-sign Ben is translated as “Reed”. It is a conduit between heaven and earth. On 2-Ben the duality between these two extremes stands out. When the journey is underway a fateful question arises: “Is this a road of sublime aspirations or of earthly needs?” This question is not easily resolved, since it arises from a preconception that previous roads I’ve taken led me either up to the spiritual or down to the material. However, on a broader scale, which cannot yet be fathomed so early in the journey – a road is simply a road, and while walking it it’s better not to be distracted by wondering where it might lead. Ben is associated with leadership, but when coupled with the number 2 it could mean an iffy kind of leadership. It all depends on how 2-Ben is channeled. If the road’s direction is clear, 2-Ben is very decisive, no doubts nor hesitation. But if you’ve lost your sense of direction, it’s probably best just to go wherever the other guy’s going. Interesting note: David Ben-Gurion declared Israel’s independence from the British mandate on the day 2-Akbal, which is one of his personal burner days. The 3rd day of every trecena is a day of rhythmic action and communication, since it comes right after resolving the duality and indecision of the 2nd day. Ix is the Jaguar/shaman, and its energy is somewhat elusive, indirect, and feline in nature. Combined together, 3-Ix is like an inquisitive cat that wants to know everything and can’t stand still. The Jaguar’s element is nature, and it appreciates the scenic road, regardless of where it leads. The sun-sign Men is the Eagle that soars high above the road and sees dead-ends and insurmountable barriers that cannot possibly be foreseen by its predecessor – the Jaguar – at ground level. The 4th stage of the journey is when boundaries are placed and the entire process is stabilized as a result. The eagle’s vision on this day helps to avoid taking the wrong turns on the Road, and teaches me that, although there are always countless roads to take, I must use vision to define and stabilize my overall destination, and as a result – maintain my freedom of movement. Woody Allen and JFK were both born on the same Tzolkin day (4-Men). In the following stand-up show from 1965 some similarities can be drawn between their common fields of interest. After getting the eagle’s-eye view of all the roads that should and shouldn’t be taken, at the 5th stage of the journey Wisdom (Cib) pinpoints the best route to take. Ultimately, only one Road is traversed, and on this day the silent introspection of Cib reveals the one true path which seems to lie right in front of me. Cib emanates the deep and ancient presence of deceased ancestors. How wise they were about the road of life, the way of people, the greeting of a strange traveler, and the assistance rendered by the local community. A farewell on equal and square terms is a wise and very ancient piece of advice. Caban stands for the deep and slow rhythms of earth itself, and on the 6th day of the trecena it provides confidence and flow. This is the day in which I take off my shoes and walk barefoot on the road. The soil relays the earth’s deep frequencies through my bare feet and reassures my that the one path that was chosen yesterday will lead me exactly to where I should be. Elephants do the same as they collectively migrate in over thousands of miles to arrive at a dry basin just before an abundant flood rushes in. To read more about Caban click here. 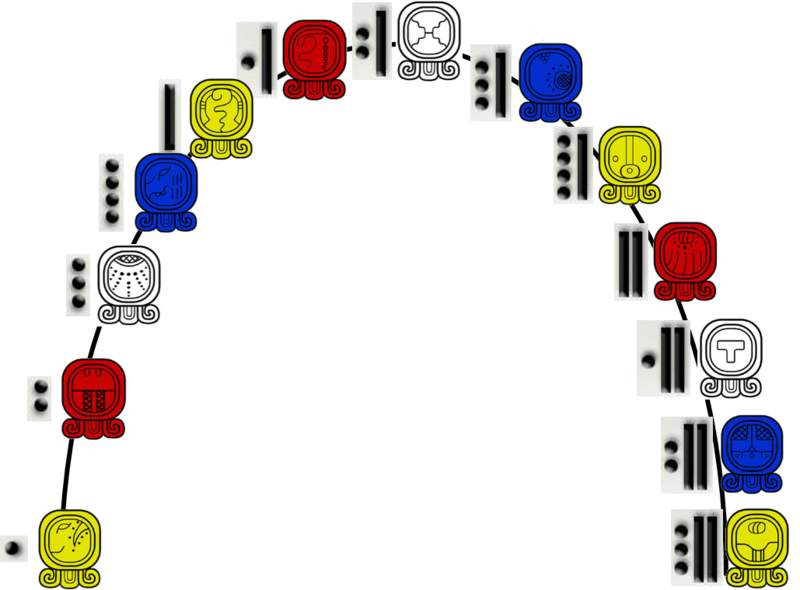 Note that in this trecena, stages 6 through 9, which represent the balanced phase of the process – are occupied by the last 4 sun-signs of the uinal (Caban, Edznab, Cauac, and Ahau). This means that the highest level of sophistication is called for in order to transition from planning the path to manifesting it. Note also that Steve McQueen (6-Caban) was born the day before his karate master – Bruce Lee (7-Edznab), and Chuck Norris (5-Cib) was born a day before McQueen. Three martial arts actors, one path. Edznab is the Mirror of reality, and 7-Edznab is the only day in the Tzolkin when the Mirror meets the reflective number 7. This is a powerful day of stark reality right in your face. There is absolutely no room for deception or second guessing. Edznab is the knife that cuts through illusion, and when it appears on the midpoint and apex of the journey it reflects both the humble and hesitant beginning of the first step (1-Eb) and the abundant ascension that lies in promise at the end of the road (13-Kan). It is the proverbial point of no return. The second half of any given trecena revolves around a process of manifestation. In the first half an energetic wave of change is gathered below the surface of existing reality (stage 1 through 5). It then reaches equilibrium around the crest (6 through 9), crosses the breaking-point of stage 10 (Manifestation), and finally resolves and completes the cycle (11 and 12), before the next wave begins to gather (13). The 8th day of the trecena is the day in which the theme of the previous trecena reappears to balance the effects of the current one. The previous trecena was 1-Cauac, which is the blessing of the cleansing rainstorm. On 8-Cauac an activating and balancing change takes place, as a direct result of facing the stark reality of yesterday (7-Edznab). In the context of this trecena, when the Road of Life (Eb) is chosen, and the point of no return (7) is crossed – a storm breaks out, and the old skin of the past is shed and washed away. The lesson of this day is that even when a true path is chosen, storms of change are always a possibility as I actually walk the path. It also shows that meticulous cleansing, which takes place at the everyday mundane level – invariably transforms the whole. Next is Ravi Shankar (8-Cauac) at Monterey Pop (June 1967). Only in minute 07:00 do you actually see the man. Before that it’s faces of the audience (Jimi Hendrix among them). A colorful snapshot of the deep sixties. An Ahau day is the final day of the 20-day uinal, and it represents enlightenment and the realization of all potential. 9-Ahau is the day when the 5th uinal of the Tzolkin ends, which means that on this day the entire 260-day process of gestation completes its 20-day cycle of Empowerment (5), which began on 3-Imix. 9-Ahau is when the memory of my great ancestors guides me on the Path of Life and provides patience, perseverance, and peace of mind. Although it always seems that today is much more challenging than yesterday, on this day I am reminded that those who came before us also had to choose the one true path and to leave all other paths behind. Like me, they too walked the path to wherever it led. On 9-Ahau this realization is an abundant source of comfort and insight, and it allows for enlightened completion and realization of the process thus far. The end of every road is the beginning of the next. Imix (the crocodile) is the first sun-sign, since everything begins and ends in the womb of creation – the primordial swamp that is the crocodile’s domain. The previous day (Ahau) is also called “the Master”, and in this respect, every master eventually becomes a novice of the next higher level of evolution. Therefore, 10-Imix means that the one true road manifests when I find myself back on square one. But this is scarcely a regression, since the journey itself has transformed me. Equipped with the nurturing instincts of Imix, and the responsibility that stage 10 invokes – it is now time to go “back to school” to guide and show my fellow companions how the Road of Life can be chosen and travelled. “I maintain that Truth is a pathless land, and you cannot approach it by any path whatsoever, by any religion, by any sect.” – Krishnamurti (11-Ik) dissolving the Order of the Star in the East in 1929. 11-Ik is a gentle breeze which refines the newly manifested path and perfects it. Ik is the essence of intellect which distinguishes between one thing and the other and enables me to communicate with my fellow travelers. Coupled with the wind, the energy of stage 11 can be described as a wise teacher who doesn’t try to change his pupil’s nature, but instead makes subtle corrections and upgrades, so that s/he may better fit whatever’s already manifested without fundamentally changing his/her essence. 12-Akbal is a day of profound understanding that, no matter how well-travelled and planned a Road may be – the way I experience and walk it always remains unknown. I come to realize that during the previous days of planning, walking, and charting the Road it was always intuition that guided me. The destination doesn’t wait at the end of the Road, it is formulated step-by-step by the bravery of the traveler, who walks the unknown path into the Night, and emerges at dawn to inspire future adventurers. George Carlin (12-Akbal) was brave in his own special way. Here he is reminding us about the things that make us the same. Stage 13 represents the duality between the current process and the consequent one. As a metaphor, stage 13 can be equated with an ace on the blackjack table, which can either be valued as 11 or 1, depending on its surroundings. It’s completely present or altogether absent. In the growth process, stage 13 is called “Fruition”, and the fruit holds within it the seeds of the next process of evolution. Since the sun-sign Kan means seed (among other meanings), 13-Kan is the only day in the Tzolkin when the concept of seeding and future growth is present in both the sun-sign (nature) and number (expression). In the context of this trecena, 13-Kan shows that once the true Road of Life is manifested and perfected, countless other roads can be charted and traveled. One seed makes many seeds, and one road leads to many roads. When this concept is realized the stage is set for life’s drama to unfold, as the serpent 1-Chicchan begins.